A rhino was killed by poachers in India's Kaziranga national park on the same day the Duke and Duchess of Cambridge toured the sanctuary. The adult male rhino was shot dead and its horn was cut off. Just hours earlier, the royal couple came within 50 yards (metres) of a rare one-horned rhino during their safari. The 430 sq km (166 sq mile) park, in the north-eastern state of Assam, is home to the world's largest concentration of one-horned rhinos. Wildlife poachers pose the biggest threat to the animals, killing them for their horns. The animal is currently listed as "vulnerable" by conservation groups. Seven rhinos have already been killed in 2016, while 20 were poached in 2015. 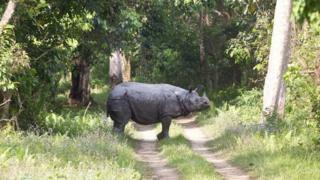 Kaziranga is estimated to be home to 2,400 one-horned rhinos out of a global population of 3,300. The national park is also home to elephants, water buffalo, the endangered swamp deer and tigers.